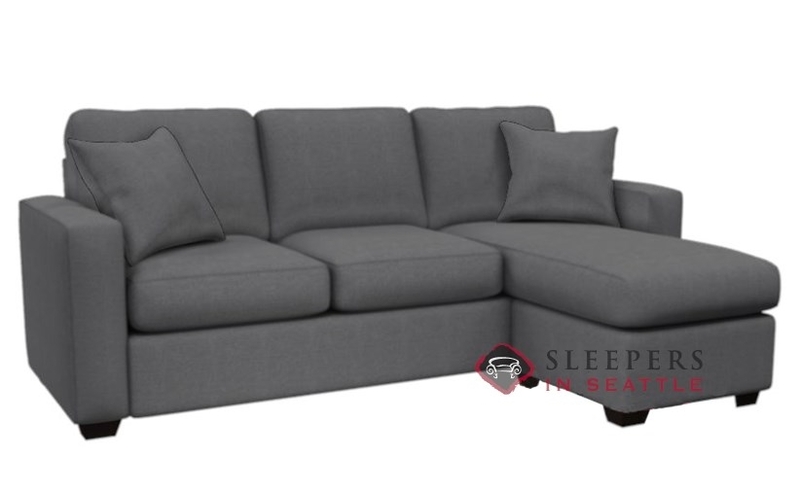 The three-seat Stanton 702 Chaise Sectional Sleeper with a Queen size bed has straight arms and straight back cushions, giving it a Mid-Century Modern look. Available in over 200 fabrics, creates your in our Design Center, today. The unique chaise of the 702 can be moved to either side of the piece with incredible ease--allowing for a queen size bed to use the entire expanse of the couch. Special Offer Upholsteries: any Hayden. I needed something compact and I definitely found it with this one. I went with one of the Stoked fabrics and saved some extra money. If you're looking for something small and cozy I don't see how you could go wrong with the 702. 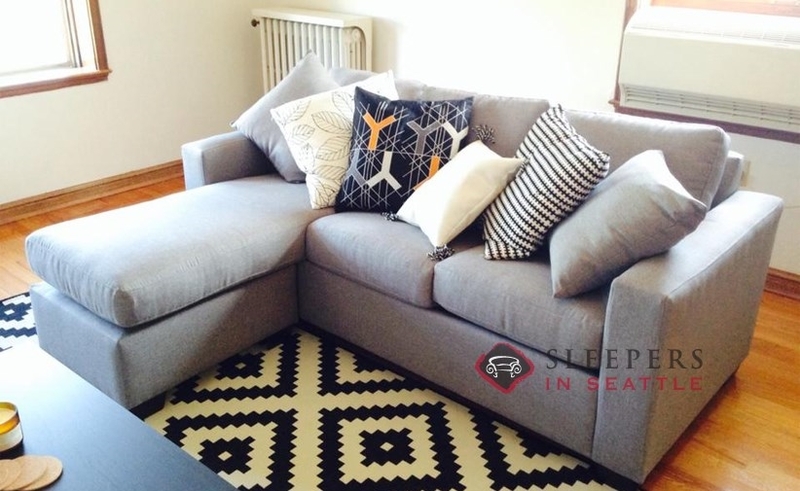 This was the smallest chaise sectional sleeper I could find after looking, well, forever. Really happy with the quality and the comfort. Was delivered promptly. All in all very happy. This model is available in a wide array of fabrics. In our Sleeper Design Center, each fabric has its fiber content noted. On the highlighted upholsteries above, "Hayden" is 100% polyester, while "Stoked" is 63% Polypropylene and 37% Polyester. Both of these fabrics are exceptionally durable and easy to clean. What are the cushions filled with? Poly? Down? Blend? etc. This model is made with multi-layered reflex cushions, including poly fill, and wrapped in a dacron cover--all supported by a heavy gauge sinuous spring base. A photo is included below of the Stanton sleeper mechanism. The included mattress offers a great night of sleep but can also be upgraded to either the Deluxe or Premium option. It also is indeed available as a Full although it is not currently highlighted on our site. Please contact us using [email protected] for pricing info. Does that mattress for the bed pull out, or does the sofa fold flat? Would it be possible to see a picture of the sleeper configuration? Yes, absolutely the mattress pulls out! This is nothing like a futon--rather a real mattress is taken out after the seat cushions are removed. I apologize for not having a photo of this model in the 'open' position at this time. How does the mattress pull out with the chaise attached? Do you perhaps have a picture of how that works? In the case of the 702 Chaise Sectional, the base of the chaise scoots out of the way, and the seat cushion which covers the chaise section is removable, just like the other seat cushions. Once bare of seat cushions, the premium mechanism with the mattress of your choice is easily opened! I apologize for any confusion caused by the images--but the bed does indeed open across the entire seating width of the piece, as the base of the chaise lounge is NOT connected to the mainframe of the sofa. The base of the chaise scoots out of the way, and the seat cushion which covers the chaise section is removable, just like the other seat cushions. 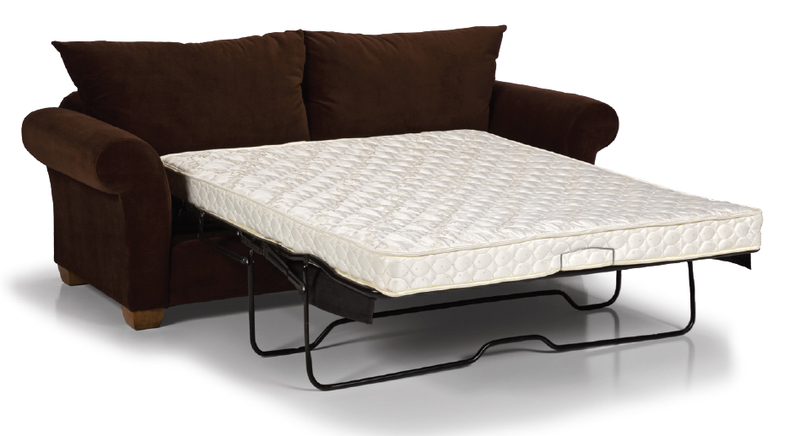 Once bare of seat cushions, the premium mechanism with the mattress of your choice is easily opened! We unfortunately do not currently have a photo to showcase this, but hope our explanation helps. Does the stanton come with the chaise on the other side? 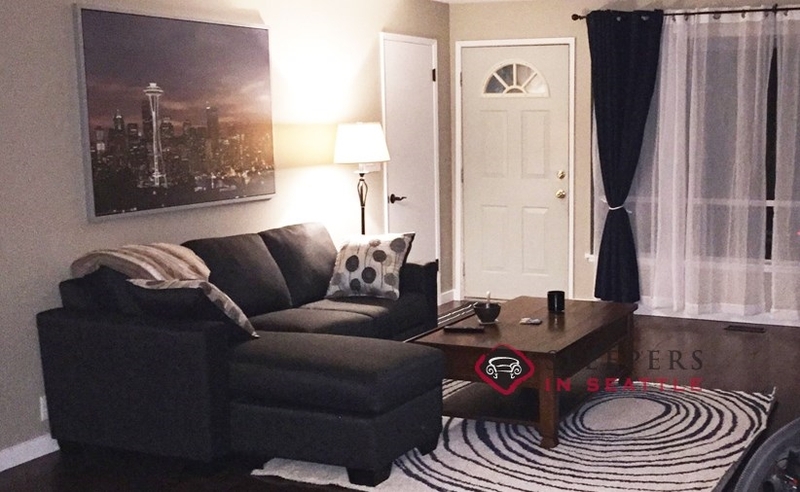 The 702 Chaise Sectional is one of our coolest products. The chaise is essentially an extended seat cushion that has an unfinished ottoman underneath which can slide to either side. 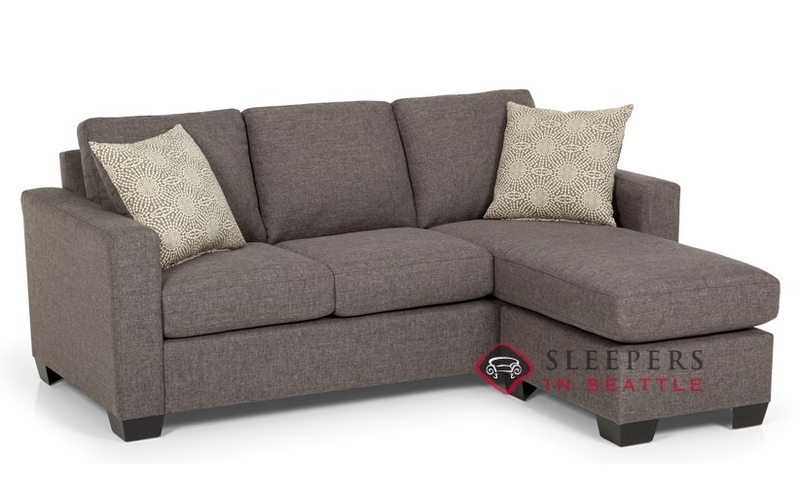 Most chaise sectionals have a sleeper which opens adjacent to the chaise, however this model has a modular chaise base, which allows for the queen mattress to open across the entire expanse of the couch. I have a very narrow opening to get a couch in... I was told that to google lazy boy because they have sofa's that can come apart. I love this sofa, can this style fit through a narrow opening. and be taken apart and reassembled? This style can be delivered through narrow doorways, and taken apart to an extent when necessary. Most of the Stanton sleepers come with Special Offer fabric options. The Stoked fabric group is available as a Special Offer for the 702, which reduces the price by $60. The Stoked fabrics come in a few different colors and are made from 63% Polypropylene and 37% Polyester. Separately, we do indeed offer a Price-Match Guarantee. Simply send an email to our team at [email protected] and we'll take a look. 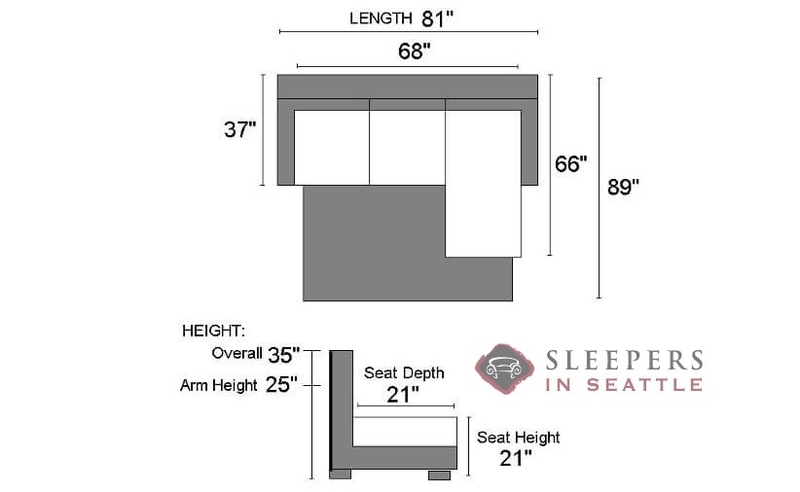 Does the 35" height reflect the back frame only or the back frame plus the added height of the back pillows? Also, are the legs removable or part of the frame? 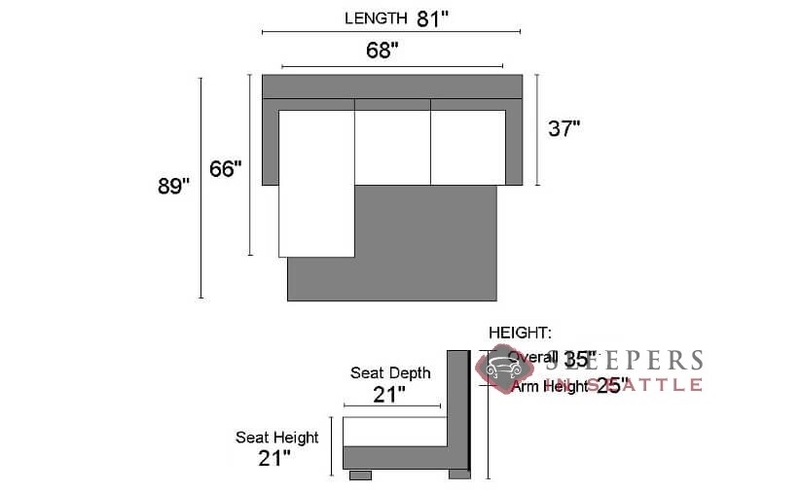 35" is the measurement to the top of the cushions. The height of the back frame, not including the cushions, is about 30". Absolutely, the feet can be removed. Many of your sleepers offer upgrades to the mattress. Can the Stanton 702 Chaise Sectional Queen have upgraded mattresses? If so, what upgrades. Also, do any of the optional coverings include leather? All of the Stanton sleepers can come with an upgraded mattress. To view the available options, click 'Start Customizing' to the right of the photo. Available mattress upgrades will be shown once you click on the Upgrade box. Stanton does not offer leather. Re: Stanton 702 Queen Sleeper. What is the size of the mattress? The Queen mattress on the 702 is 60"W x 72"L.
What is the total dimensions of couch with the queen size mattress extended? This measurement is not included in the photo. Also what is the minimum clearance disctance for example will it fit through a 30 inch doorway? The total footprint, from the back of the couch to the foot of the bed when the mattress is open, is 89". The minimum clearance distance is 29"--though if there is a decent amount of space around the doorway, this piece could fit through an even tighter doorway.